During the past six months, Charlie Ban has been quietly but steadily chipping away at his half marathon PR, which, as of last year, was circa 1:12:20. Then in November, he hit a 27-second PR in Richmond with a 1:11:52. After a December marathon personal best in the highly classified "Operation Wild Pitch," Ban lowered his half time yet again with a 1:11:16 at RNR USA, good for a sixth place finish. In Frederick on Sunday, Ban ran 1:11:35 for a fifth place finish. Although Richmond and RNR are more than fair courses, this weekend's run was probably his best result at the half distance given the challenging topography of Frederick's course. 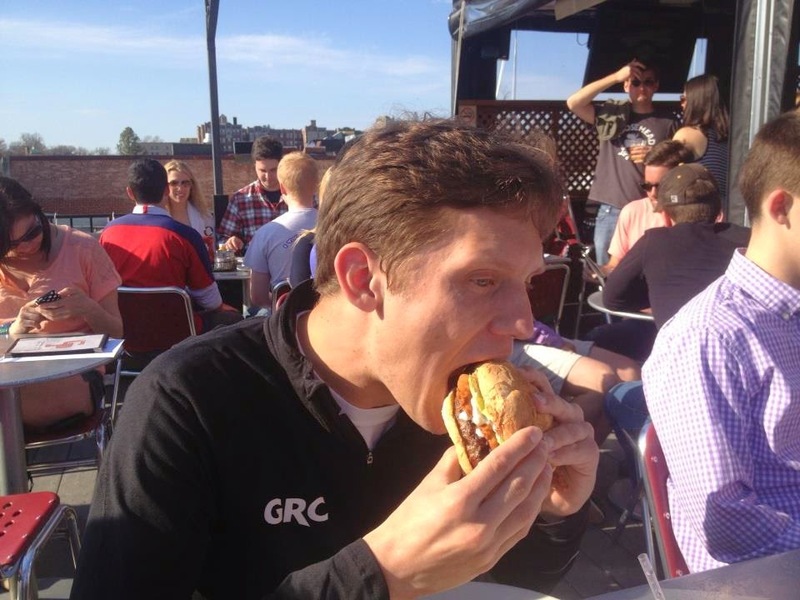 Ban, seen above chipping away at a hamburger, subscribes to a race preperation theory known as "the hard training," which most observers credit for his recent successes.